For other uses, see Sleeping bag (disambiguation). A mummy bag, so named because it has an insulated hood which keeps the head warm. A foam sleeping pad can be seen underneath the sleeping bag. A sleeping bag is an insulated covering for a person, essentially a lightweight quilt that can be closed with a zipper or similar means to form a tube, which functions as lightweight, portable bedding in situations where a person is sleeping outdoors (e.g. when camping, hiking, hill walking or climbing). Its primary purpose is to provide warmth and thermal insulation through its synthetic or down insulation. It also typically has a water-resistant or water-repellent cover that protects, to some extent, against wind chill and light precipitation, but a tent is usually used in addition to a sleeping bag, as it performs those functions better. The bottom surface also provides some cushioning, but a sleeping pad or camp cot is usually used in addition for that purpose. The bottom surface of a sleeping bag may be moderately water repellent, but a plastic tarp or groundsheet is often used to protect against moist ground. There are a range of sleeping bag models designed for different purposes. Very lightly insulated sleeping bags are designed for summer camping use or for indoor use by children during slumber parties. Well-insulated bags are designed for cold weather use. The most well-insulated and lightweight sleeping bags, which are designed for serious hikers and adventurers, are more expensive than lightly insulated sleeping bags. One subcategory of cold-weather sleeping bag, the mummy bag, is so named because it has an insulated hood for the head. A bivouac sack (bivy) is a waterproof cover for a sleeping bag that may be used in place of a tent by minimalist, experienced hikers. A bivy bag may also be carried by day hikers as a backup or emergency shelter, to be used if they cannot make it back to their starting point by nightfall due to inclement weather or getting lost. The "Euklisia Rug", from Ancient Greek εὖ (well) and κλισία (cot, sleeping-place), patented by mail-order pioneer Pryce Pryce-Jones in 1876, may have been the first forerunner of the modern sleeping bag. Pryce-Jones, a Newtown, Montgomeryshire Welsh entrepreneur developed the bag and exported around the world in the late 19th century. Documents show he sold 60,000 of these rugs to the Russian army - and the British army also bought them. There are records of civilian uses too - among missionaries in Africa and pioneers in the Australian outback. 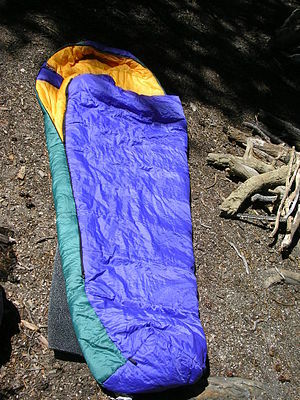 A basic sleeping bag is simply a square blanket or quilt, fitted with a zipper on two or three sides, which enables users to get into the bag and then close it up. A sleeping bag of this type is packed by being folded in half or thirds, rolled up, and bound with straps or cords with cord locks. The basic design works well for most camping needs but is inadequate under more demanding circumstances. 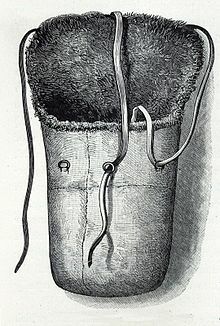 The second major type of sleeping bag, sometimes called a mummy bag because of its shape, is different in a number of important ways. It tapers from the head end to the foot end, reducing its volume and surface area, and improving its overall heat retention properties. Some bags are designed especially to accommodate women's body shapes. Most mummy bags do not unzip all the way to the feet, because the zipper is a weak point in any sleeping bag's insulating qualities. Together with the tapered shape, this design feature helps protect the feet, which are more vulnerable to heat loss than other parts of the body. Another design feature is a drawstring, equipped with a cord lock, at the head end to help prevent the escape of warm air. A mummy bag often cannot be rolled like a rectangular bag. Instead, it is simply stuffed into a stuff sack or compression sack. The bottom of a sleeping bag typically does not provide significant insulation, because body weight crushes the loft of the insulation material. It is therefore necessary to use a pad or other less crush-able insulation underneath the sleeper, especially in cold weather. Due to this, some sleeping bags do not include insulation on the bottom. Some include a sleeve for holding a sleeping pad. Additionally, some campers, especially ultralight backpackers or hammock campers, have started to use a top quilt, essentially a sleeping bag without a back. Some top quilts include a foot box, while others are just simple blankets. 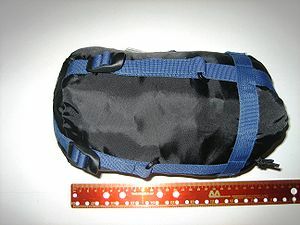 A highly compact sleeping bag measuring 23 cm/9 in with a diameter of 12 cm/5 in when packed but 210 cm × 65 cm (6.89 ft × 2.13 ft) when unfolded. Many insulating materials are available for sleeping bags. Inexpensive sleeping bags for warm weather use or use by children indoors typically have a layer of synthetic quilt insulation. Outdoor professionals and serious amateur adventurers usually prefer either synthetic fill (e.g. PrimaLoft), or natural fill (e.g. down), and they have debated the merits of these materials for years. Synthetic fill does not readily absorb water, dries easily, and provides some warmth even when thoroughly soaked. These properties may save the owner's life if, for example, the sleeping bag is accidentally dropped into water on a cold day. Synthetic material is also firm and resilient, so it insulates well even underneath a person's weight. On the flipside, synthetic fill cannot be compressed as much as down and it weighs more, causing such bags to take up more space and weight when not in use. Furthermore, synthetic insulation tends to break down faster than its natural counterpart. Down fill weighs less than synthetic and retains heat better, but usually costs more. Down must be kept dry; a soaked down sleeping bag may provide even less insulation than no sleeping bag at all, leading to hypothermia. Newer, more technically advanced sleeping bags often have water-resistant shells and can be used in damper conditions. It is also recommended to keep a sleeping bag in a larger sack (storage sack) as opposed to the small traveling sack (compression bag) during long periods of storage. However, many regular backpackers and hikers agree that hanging a sleeping bag, taking care to move the position of the bag on the hanger at intervals so as to not create a "dead spot" (a spot where the fill has been crushed so that it is no longer useful), is the best method of storing a bag for long durations. Other materials, notably cotton and wool, have also been used for sleeping bags. Wool repels water nicely and also resists compression, but it weighs much more than any alternative. Cotton suffers from high water retention and significant weight, but its low cost makes it an attractive option for uses like stationary camping or car camping where these drawbacks are of little consequence. Cotton insulation does not provide warmth if it becomes wet (due to the sleeping bag falling into water), so cotton-insulated sleeping bags are not used by professionals or serious hikers. In Europe, the EN 13537 standard (introduced in 2005) normalizes the temperatures at which a sleeping bag is rated for use. In March 2010, REI began requiring American manufacturers to follow the EN 13537 standard, and in October 2016, ISO 23537-1:2016 standard replaced the EN 13537 standard. the upper limit is the highest temperature at which a 'standard' adult man is able to have a comfortable night's sleep without excess sweating. the comfort rating is based on a 'standard' adult woman having a comfortable night's sleep. the lower limit is based on the lowest temperature at which a 'standard' adult man is deemed to be able to have a comfortable night's sleep. the extreme rating is a survival only rating for a 'standard' adult man. This is an extreme survival rating only and it is not advisable to rely on this rating for general use. The transition zone, in between the comfort and lower temperature, is usually considered as the best purchase guideline. A sleeping bag's rating typically indicates the lowest temperature at which it will keep the average sleeper warm. For example, with a 0° bag, a person should be able to sleep in 0° temperature, but not necessarily comfortably. Girls with sleeping bags at a sleepover. There is no standard measurement rating in the U.S., so a 20° bag from one company may not provide the same warmth as a 20° from another company. Other important variables include what the user plans to wear while sleeping, what type of sleeping pad is used, and how well the user holds heat in the bag. It has been shown that moisture (either externally, or from sweating) severely decreases the insulating effect of sleeping bags. Indoor sleeping bags, sometimes called slumber bags, are widely available, often for use particularly by children. These are usually not designed to be weatherproof and are often made of natural fabrics instead of the synthetic fabrics commonly used for outdoor sleeping bags. Children's sleeping bags in particular often feature elaborate, brightly colored printed designs, such as images of popular media characters. Slumber bags make floor sleeping more comfortable, and are often used for sleepovers, family visits, and other situations where there are not enough beds for everyone. A child in an infant sleeping bag. An infant sleeping bag is a bag-like garment or covering worn by infants for sleeping in. Infant sleeping bags differ from regular sleeping bags in design and purpose, being designed primarily for indoor rather than outdoor use, and usually featuring either arm holes or sleeves. The definition used in the British Standard for safety of children's sleep bags is "sleep bags for the use of children with a minimum weight of 4 kg designed to provide sufficient warmth so as to remove the need for additional bedding when sleeping in a cot or similar product in which a child is contained." It goes on to exclude "garments with sleeves and feet, i.e. sleep suits or baby grows, or to products designed primarily for outdoor use or to keep children warm when in a pushchair." 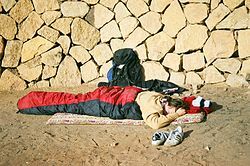 Wikimedia Commons has media related to Sleeping bags. ^ "Euklisia Rug". A-day-in-the-life.powys.org.uk. Retrieved 24 August 2013. ^ "A History of the World - Object : Euklisia Rug". BBC. 1 January 1970. Retrieved 24 August 2013. ^ "Camping tent". Retrieved 24 August 2013. ^ Pidgeon, Dave. "The Ratings Game: Standardizing Sleeping Bag Temperature Ratings". Backpacker. Cruz Bay Publishing. Retrieved 15 April 2019. ^ "ISO 23537-1:2016 Requirements for sleeping bags". International Organization for Standards. Retrieved 15 April 2019. ^ British Standard BS 8510:2009 Child use and care articles. Safety of children's sleep bags. Safety requirements and test methods.